Stomata are minute pores present on the surface of leaf and young stem. They are meant for the exchange of gases, also lose of water vapour, when open. The loss of water through stomata is called stomatal transpiration. Stomata are of different types. 1. These stomata remain open during day time. 2. Found in all ordinary plants. Scotoactive stomata (Scoto means dark): The stomata opening in dark are called scotoactive stomata. 1. 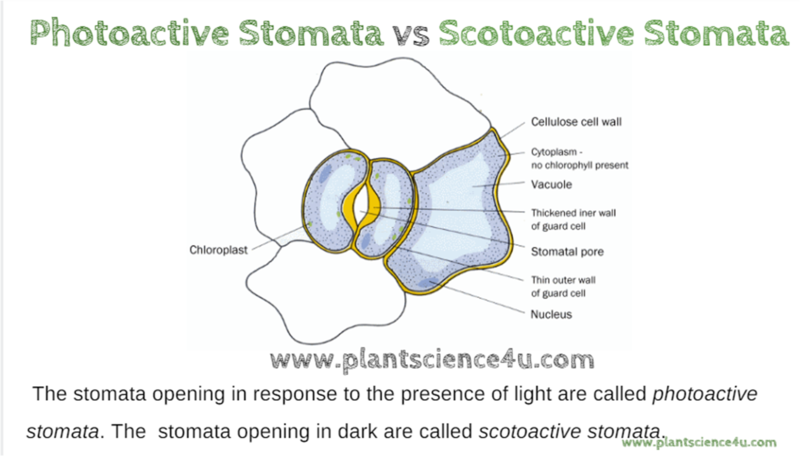 Stomata remain open during night.